Painter, Jo Weiss’ visual language is made with reductive marks which create a kind of universal communication. Gesture. The communication of imminent action. Physical, spatial and material. The idea of gesture, of compelling movement and content, has always been an element in my work, whether the suggestion of the play of forces between gravity and resistance or positive form and negative space, and how these ideas can be realized in paint. Lately, I’ve begun to paint translations of various Deposition compositions. Beginning with a Titian, I found myself reducing the visual aspects to the isolation of the hands. The cross cultural ability of pathos to be communicated through the action of the hands became the focus. One doesn't need the entire story to glean the contextual. Even if the story is absent, the essence of expression conveys. Several paintings of Depositions from various artists followed exploring this concept of reduction, hand "talk," and material gesture. Most take place within a shallow, ambiguous plane. Deeper space concerns are beginning to hold my interest while moving away from specific translations into a broader host of sources, including invention. Long interested in the study of shape, form, and movement, Jo Weiss has produced a variety of works—landscapes, still lifes, and portraits—nearly all of them showing a powerful interest in gesture. In paintings such as Golden Crane or Demoiselle Dawn, we see, respectively, assertively rendered cranes and migrating geese. Both are dramatic works. The cranes resemble dancers, made human by their gestures; the geese are perseveringly aloft by the exercise of their wings. Interestingly, both the cranes and geese invite attention across two realms. The cranes exist in animal and human realms, while the geese, having evolved out of the inanimate world, are one culmination of those processes in living physical form. Gesture is what animates both images, and is what gives them their transformative power. Weiss's ability to generate this power is remarkable, and is achieved in large part by how she has both minimized and abstracted her works. The minimized composition focuses our attention, while the abstraction has the effect not of muting but of intensifying the gestures. In Golden Crane, gesture turns our thought from cranes to dancers. We are invited to consider the association and understand that gesture is what makes the metaphor possible. In Demoiselle Dawn, gesture reminds us of the wind, weather, seasons, and, by extension, of the unseen currents by which evolution occurs. We think of those currents, how the cranes are essentially borne out of them, but are also reminded that the cranes carry with them on their wings the precious cargo of their own living bodies. In both of these images, gesture is what establishes the metaphors, birds to dancers, wings (through wind) to evolutionary currents, and, in Demoiselle Dawn, the contrast between ongoing evolutionary processes and the life forms which they produce. In Weiss's more recent work, the communicative power of gesture is perhaps even more poignant. When she is concerned with hands—hands reaching through color washes (Discomfort), hands in concert with other hands (Pontormo Pink), and hands reaching through canvas (What Has Been Done)—Weiss both intensifies her interest in gesture and enjoins a long history of artistic interest in hands. In the latter case, she reminds us of the ancients' interest in hands, of the anatomical studies of hands, of all the hands and their symbolic meanings in religious and other contexts. She reminds us of her hands, and our hands, how they can be used to paint, touch, work, and communicate. We are quite familiar with them. We know few other things like the backs of our hands. Weiss's use of gesture, however, is what really energizes her work. The hands communicate both powerful and subtle emotions, sometimes more than one emotion at the same time. In Discomfort, the downturned hands are limp, but not lifeless. They communicate discomfort, yes, but also despair, introspection, isolation, and the redemptive possibility of touch. In Grievance, the upturned hands suggest incredulity, loss, despair, and, again, the possibility of redemptive touch. Weiss refers to her work as a response to "the impulse to make marks"—such a simple, unpretentious description of her work. But don't be misled. What Weiss does with her marks is really quite remarkable. In making her marks, Weiss takes a minimalist's approach, sparing nearly everything but the emphasis on gestures. These she essentializes, or breaks down into constituent parts, or marks. Because Weiss additionally abstracts these marks, they become something new. The abstraction has the effect both of intensifying the gestures and of decontextualizing them. Intensified, they become objects for phenomenological study. Decontextualized, they elude mere canvas-based significance and become, yes, objects for phenomenological study. This transformation has the effect of universalizing Weiss's marks so that while they figure in her work, they might also float to new contexts—personal, cultural, or aesthetic—in which they become newly significant. Creating universalized marks also has implications for both the use of color and point of view. In Weiss's work, the palette shrinks and the viewer is carefully situated so that access to her subjects can both revise those subjects and free them up for lexical play. In Weiss's work, the use of these universalized marks simultaneously focuses us on her work, reminds us of previous work, and then frees us from that work. Ultimately, the hands she paints are our hands, both literally and figuratively. What might we do with these hands? What will we do? I think that is one of the important questions Weiss wants each of us to ponder. I grew up in a family immersed in art. Taken through museums around the world, I reveled in the possibilities each work opened to me, from the profound to the quotidian. While these experiences were frequent, I never really considered devoting my life to the making of images as I was often alone and had few people to explore ideas with. As a result, it came as something of a eureka moment to realize that I could, in fact, build on the reservoir of images and motifs gathered through the years. Pursuing my education with an emphasis on the figure, I have moved from direct perception to invention. I liken the physicality of painting to the choreography of stage or ballet as I exploit what I can from the figure’s gesture into something redolent of impending action. The very material of paint and the demands of composition provide me with the vehicle with which to explore these ideas. 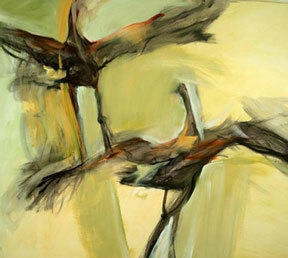 Local painter Jo Weiss is hardly the first artist toliken dancers to birds. But where "Swan Lake" combines avian and human, Weiss’s "Gestures" divides the two - and seems more compelled by wings than limbs. Her exhibition at Washington Studio School includes a few pictures of bending womanly forms and more than a dozen of cranes at sanctuaries in India and Wisconsin. Their gestures are fluid and elegant as the paintings that capture them Most of these are oil, but Weiss also uses acrylic, ink, crayon and more, working on linen canvas and occasionally, paper. The variety of media is matched by the range of styles – from impressionist to expressionist, and sometimes in the same picture. The striking "Demoiselle Dawn," for example, conjures flight with sideways strokes, while vertical paint drips add to the overall feeling of movement. "Flight," in pencil and gouache on paper, is a study in black and luminous grays that suggest Asian scroll paintings. Others are more realistic, but all are linked by the themes and visual poise. Even a cursory glance at art history will show that across both time and geography artists have been gripped by the diverse imagery of the crane. Artists in ancient Asian and Arabic nations, Greece, Native American and Inuit cultures, and more all included this graceful bird in their work, as well as their mythologies. Jo Weiss, an artist based in Georgetown, would be happy to tell you all these facts and more, for cranes have inspired her as well. She has filled the main-floor gallery of the Washington Studio School with paintings exploring the form, movement, and landscapes of the crane. Though the paintings are all recognizable as Weiss’ style, each of these explorations produced vastly different artworks. Several of the pieces function as portraits of a sort, realistically depicting one or two birds. Also, Weiss has included in the exhibit studies of female figures as they bend forward. These were painted in order to explore relationships of physical form and are highly related to her crane portraits. Weiss found her inspiration for this body of work during several trips to crane sanctuaries in Wisconsin and in India. During these visits she made several study drawings and took photographs to serve as reference points for the paintings she created later in her studio. The fact that Weiss spent so much time observing cranes is especially evident in her many paintings of cranes in flight which depict a sense of movement that can only be understood in person. 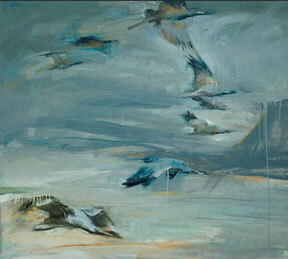 Especially lyrical and graceful, these works capture the beauty of the birds’ movement. Vertical Rise, hidden at the top of the staircase, and Golden Crane (Double Lift) are particularly lovely, but Weiss’ large graphite and gouache on pencil, Flight, is the most successful in capturing a crane’s very moment of takeoff. Throughout this series, Weiss uses realism, lyricism, and once even a blocky near-abstraction to depict the birds as they fly. When the artist and I discussed her body of work she explained that she became interested in the cranes because of their similarity to the human form. For Weiss, the cranes became a new, more original medium through which she could continue to explore ideas of movement and posture. Yet now, she has gravitated towards the human form again. Weiss doesn’t think the cranes will leave her mental imagery, but their future in her artworks is unsure. One of the most recent works in the show is a partially-abstracted painting of Jodhpur, the blue city of India. Since Weiss has been interested recently in the compression of forms the compact city was an ideal subject. If this piece is at all telling, the next works out of Weiss’ studio will be engrossing and stirring, new manifestations of her sustained interest in the relationships she finds between movement and form in all things.